"In the next little while you can expect to be challenged when dealing with a group, or community. Is pride getting in the way of a true resolution? Are you doing your part? Do you need to cooperate more? 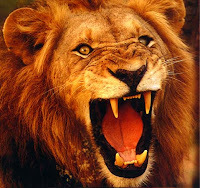 The lion does not fight for the sake of confrontation alone. They avoid conflict unless necessary. But sometimes confrontation IS necessary and when the time comes, take the high road and keep your dignity. Be stealthy, trust your instincts, this is a time of reawakening. And don't be afraid to roar to protect your self interests!"